When I came across an article on line from the Seattle Times about Panzanella, I knew some of my tomatoes were destined for greatness. There was a Panzanella I knew I’d love! One with lovely, slightly crisp, slightly chewy home-made “croutons” in it. I admit to a bit of an aversion to some Panzanellas – and to soggy bread. Not a problem in this salad. We ate this to death, three of us at the house. Polished it off. Practically licked the plates clean. The recipe said six servings and I had actually made more – I just had to use up more of our tomatoes…and we still ate it all. It’s that good. Or maybe we’re just piggy piggies. Or both, lol!! It was pretty much our meal. There’s a lot of olive oil in this but the saving grace – it’s the good kind of oil, full of Omega-3. The dressing is fantastic, too; a bit of a departure using Balsamic, but we loved it. I made a few slight adaptions to it, but in the future this is one I’ll double for another salad later in the week. The combo of earthy Balsamic and zippy Red Wine Vinegars -ah-maze-ing! Preheat oven to 250 degrees. Toss the bread cubes in 2 tablespoons olive oil; add more oil if needed to coat the bread cubes thoroughly without drenching them. Spread the cubes on a sheet pan and bake for 20 to 25 minutes until the bread is crispy like a crouton. Turn several times, adding a bit more olive oil halfway through if the bread doesn’t seem well coated. Make the vinaigrette: Mince garlic as finely as possible, then smash it against the cutting board with the side of the knife. Place in a bowl with the vinegars, mustard and salt and pepper. Slowly drizzle in olive oil, whisking constantly until all of the oil is incorporated. Taste and add additional salt and pepper if needed. Let vinaigrette sit at room temperature for 15 minutes before adding to the salad. Mix tomatoes, onion and bell peppers in a salad bowl. Add half the basil and a little salt. Add 2 tablespoons vinaigrette to salad, toss and let sit for 15 minutes. Add the bread cubes and the remaining vinaigrette, mix everything together and let sit for at least an hour or up to four hours in the refrigerator until ready to serve. Right before serving, top the salad with the remaining basil leaves cut into ribbons. I’ll be sharing this recipe on Fiesta Friday #138 , Angie’s Link Party – and I’m hosting this week with the incomparable Johanna of French Gardener Dishes. I hope you’ll join us there as well as on Throwback Thursday, a weekly endeavor that includes myself and a couple of great blogger/friends! This entry was posted in Click here for Bargain Meals, Click here for Fabulous Food Posts and tagged Balsamic Vinegar, Bell Peppers, Bread, Croutons, panzanella, Red onion, Salad, Salad Dressings, Tomatoes. Bookmark the permalink. All I can say – I NUST make this. This salad is too good to pass. I have to admit I’ve had an aversion to panzanella based on nothing really. But this does look and sound delicious! I’d come over and help you eat the double batch! Me, too, Carlee. If someone would have told me I’d get to eat a salad that’s half wonderful croutons and half veggies I would have been on top of this sooner, lol!! Thanks! It really hit the spot. I’m just about craving it right now! Wonderful – memories of Tuscany!! 🙂 – Can eat this happily a couple of times per week. Thanks. If my kitchen is still not packed up I’d better grab the red wine vinegar tomorrow! 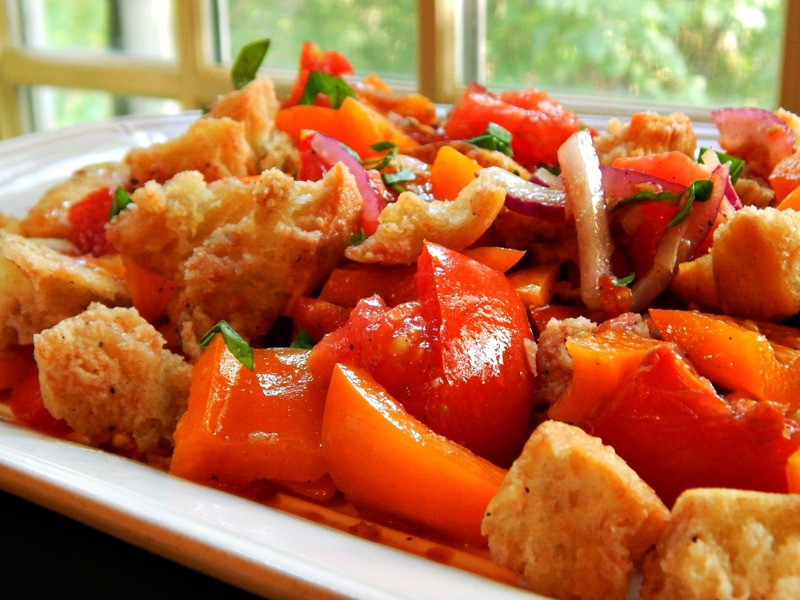 Love Panzanella and this one has me droolng! This recipe converted me! 🙂 I’m going to go make some now, I think!! I’ve always made panzanella like this I also have a bit of an aversion to the soggy bread and also to stale bread I like to toast fresh bread. Your salad looks fantastic you can see just how fresh and juicy those tomatoes are. This is one of my favorite meals. lol I tried it because the bread was so soggy it really does make the salad do much better. I’m not a fan of pickles of most kinds … barring pickled ginger and some quick pickled slaw to serve with pupusas or banh mi. With the small amounts I use, it’s just not worthwhile canning myself. Yeah, red and orange I think. I have the worst time getting my reds to look good in pics…*shrugs* It is what it is, and the salad was fantastic! See, everything sounds better in French, lol!